RUBBER-COVERED INDUSTRIAL HOSE VALVES FOR HIGH FLOW APPLICATIONS. BUBBLE-TIGHT SHUT-OFF FOR ZERO LEAKAGE. ONLY TWO MOVING PARTS- THE BALL THAT CLOSES THE VALVE AND THE PUSH PLUNGER THAT OPENS IT-NO SPRINGS! 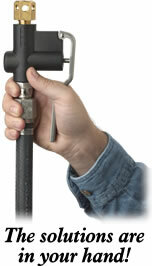 BRASS AIR OR WATER NOZZLE. IDEAL FOR PULP AND PAPER, DAIRY PRODUCTS, FOOD AND BEVERAGE, AND CHEMICAL PLANTS. PAPER RE-THREADING IN PAPER MILLS. WASHDOWN OF STAINLESS STEEL AND LINED TANKS. SHOWN WITH P/N 391000 HOSE BODY AND P/N 352696 HOSE ADAPTER FOR AIR SERVICE. 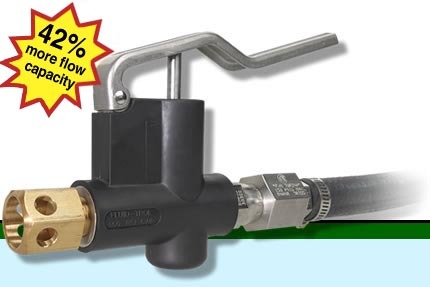 331 SCFM air or 42 GPM water at 150 psig maximum supply pressure. Note: Maximum Cold Working Pressure (CWP): 150 psig. Minimum Operating Pressure: 30 psig. Consult us on pressures outside this rating. EMAIL US FOR PRICING ON YOUR REQUIREMENTS.